See our grading notes for explanations on the grading codes we used. For EACH of the following search methods list the nodes in the order in which they are EXPANDED by the search method while looking for a solution. When everything else is equal, order the nodes in alphabetical order. As an illustration, the solution for Depth 1st search is provided below. In this problem, you are asked to construct an example showing that greedy search is not an optimal search method. (4 points) Give an example of a net for which greedy search does not output an optimal path from S to G. Remember to provide the net, and all costs (if needed) and all estimated distances to goal. 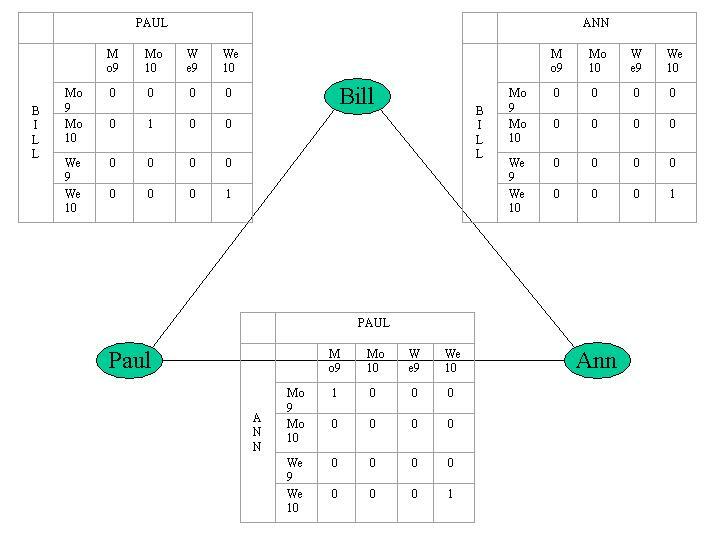 (3 points) Show the order in which the nodes are expanded by the greedy search. (3 points) What is the path produced by greedy search? Explain why it is not an optimal path. Length of S,F,G = 12. However, there exists path S,A,C,G with length only 11. Suppose you and a friend of yours are playing a board game. It is your turn to move, and the tree below represents your situation. The values of the evaluation function at the leaf nodes are shown in the tree. (10 points) Use the minimax procedure to select your next move. Show your work on the tree below. (10 points) Use the minimax procedure TOGETHER WITH ALPHA-BETA PRUNING to select your next move. Mark with an "X" the nodes that don't need to be evaluated. Show your work on the tree below and explain your answer. There is a variable corresponding to each of the persons who needs to attend the meeting. Each variable (person) has unary constraints corresponding to the time availability of the person. There are binary constraints between each two persons denoting the fact that the time scheduled for the meeting must be the same one for all persons. The meeting has to be scheduled on a Monday or a Wednesday. The meeting is 1-hour long. The meeting must start either at 9 am or 10 am. Three people must attend the meeting: Bill, Ann, and Paul. Bill: Busy Mo, Wed, Fr from 9-10, 11-12, 2:30-3. Ann: Busy Mo, Fr from 10:30-11:30, 3-4. Paul: Busy Tu, Wed, Th from 8:30-9:30, 4-5. Draw the complete constraint net, including full constraint matrices. AFTER all the constraints have been entered into the binary constraint matrices, and BEFORE the search for a solution begins, we check all the rows and columns of the binary constraint matrices for time that has all zeros, and for which the variable domain for that person still contains this time (because it was not removed by entering any of the given constraints). Such times are removed from the domain of those people, and then all binary constraint matrices for that person are updated to reflect the smaller domain. After the arc consistency checking is done, only one value remains true in each binary constraint matrix. Although all there is only value left for each binary constraint matrix, a general problem solving strategy would order the variables by how constrained they were. The depth first search would begin with an assignment of the most constrained variable. Assignments would be made for each successive node, where the selection of the next successive node would be the most constrained of the remaining variables. This would eventually lead to the discovery that the solution to the CSP is We10.